Science proving traditional medicine correct? In India the Moringa Leaf has a long history of use in traditional Ayurvedic medicine practices, being applied to aid in regulating healthy blood pressure and blood glucose levels, as well as to boost energy and mental clarity. These attribute are being studied, along with some other potential health benefits such as cholesterol reduction and anti-inflammatory effects. The scientific findings have been very encouraging. There is now evidence that Moringa Leaves are effective in helping to lower blood pressure in individuals with hypertension as well as providing additional benefits for overall cardiovascular health including its effectiveness in helping to reduce high cholesterol levels. Studies have also shown that the many nutrients found in Moringa Leaves can aid patients trying to control their blood glucose levels. These findings have boosted the interest in moringa leaves, especially in the dietary supplement sector. Of course being showcased by Dr. Oz has also helped in opening up the market for this wonderful superfood! The Moringa Leaf has caught the attention of the World Health Organisation due to its dense nutrition. WHO along with some other international health institutes, have been recommending Moringa Leaves to help combat malnutrition in infants, children and pregnant or lactating women in parts of Africa and Asia. Once the young leaves of the Moringa oleifera tree are harvested they are washed and dried at low temperatures (to reduce the loss of its plentiful nutrients). The dried leaves are then either kept as they are to produce our 100% natural wholefood Moringa Tea Leaves, ideal for tea infusions, or they are milled into a fine powder to create our pure wholefood Moringa Leaf Powder, that can be added to beverages such as iced teas, smoothies or nutritional shakes, added to foods such as cereal bars and healthy snack products, or encapsulated as a dietary supplement. Moringa leaves provide a natural, wholefood source of a range of nutrients beneficial for health, from its high content of various vitamins and minerals, to its excellent supply of high quality protein and its many phytochemicals including a range of flavonoids. It is no wonder that Moringa has become known as one of the most complete, nutrient-rich plants available to us, and is being promoted in several developing countries as a fast and effective way to help combat malnutrition. Now hitting the shelves in the western world, Moringa Leaves provide a great opportunity to capture the interest of the health conscious consumer looking for a bigger nutritional bang for their buck. Moringa Leaves are known for containing over 90 nutrients with an abundance of vitamins and minerals, including vitamin A (as beta-carotene), a range of B complex vitamins (B1, B3, B12) as well as vitamins C and K, along with minerals iron, magnesium, potassium and calcium. In fact in a gram per gram comparison, Moringa leaves are reported to have 14 times more calcium than milk, 9 times more iron than spinach, 4 times more potassium than bananas and 4 times more vitamin A than carrots. Added to this is its good fiber content with 4 times more fiber than oats. A little goes a long way therefore, and since these nutrients are being delivered in their wholefood form, rather than as a multivitamin supplement, it is believe that the nutrients are much more effectively absorbed and utilised by the body, maximizing their efficiency and helping the consumer get more bang for their buck. 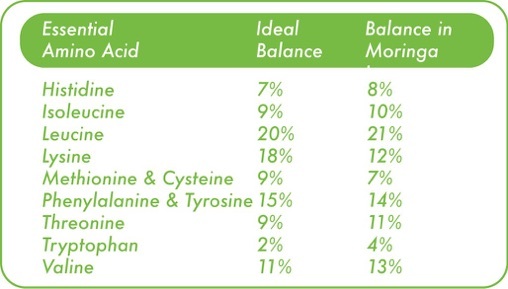 There are in fact numerous phytochemicals identified in the Moringa Leaf including many that are powerful antioxidants (studies have identified 46 antioxidants alone). We highlight here though two flavonols in particular since these have been linked to Moringa being an effective anti-inflammatory food, so vital for maintaining good health: quercetin and kaempferol, which act to selectively block chemical messengers that cause pain and swelling. A great supplement for sports fanatics therefore. Our wholesale Moringa Leaf Powder and Moringa Tea Leaves are available in bulk format, packed in 25kg fibre drums, which we ship by the pallet directly from India to all parts of the globe. Please contact us if you are interested in wholesale bulk supply of our Moringa Leaf Powder or Morringa Tea Leaves. Moringa leaves have hit the Superfood scene and are becoming increasingly popular as their benefits are discovered. It sits well in various categories from alkalizing green powders and complete protein powders to being used as tea leaves for nutritious tea infusions. Native to India, the Moringa oleifera plant is from the semiarid region at the foothills of the Himalayas, and their edible leaves have a long history of use for health and wellbeing.